Loaded potato skins are probably one of our favorite appetizers. 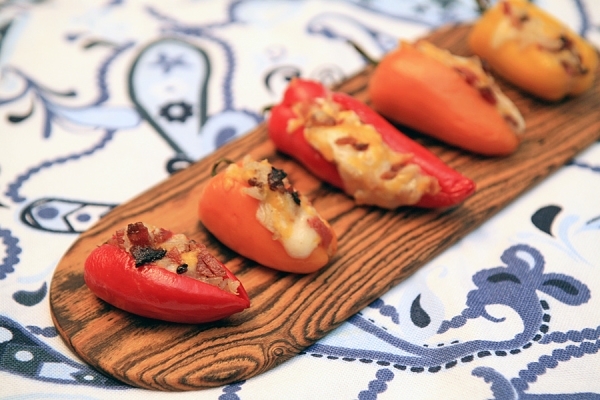 We wanted to come up with a stuffed pepper recipe that would be more figure-friendly than a potato skins, but still mimic the flavors that we love. We hit the mark with these Loaded Stuffed Peppers and they’re guaranteed to be a crowd pleaser since you can tailor it to everyone’s palate. **Important** If handling hot peppers, we highly recommend using a pair of food safe gloves. If you accidently rub your eyes with your hands while prepping the peppers, you’ll be sorry. Be sure to thoroughly wash your hands well with hot water and soap after handling hot peppers. Preheat your oven to 450. Chop your bacon into small bits and add it to a small prep bowl with the rice and three cheeses. Lightly toss to combine everything together. With a paring knife, create a slit from the top of the pepper almost to the bottom. Gently open the pepper like you would a coin purse. With your finger, remove the seeds and ribs of the peppers. Once the insides are removed, use a teaspoon to stuff the inside of each pepper with your cheese mixture. Be generous enough to pack the cheese in there, but make sure not to over stuff it. Place peppers on a foil lined baking sheet. Place them in the oven for 5-7 minutes. Remove from the oven and place them on a serving platter.